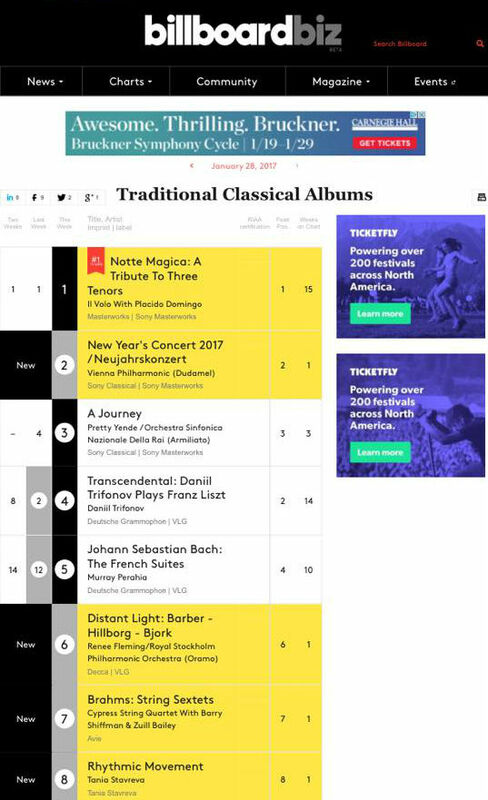 A new entry appeared on Billboard magazine’s charts this week: pianist Tania Stavreva’s self-produced, independent, debut CD, Rhythmic Movement, which introduced itself at number 8 two days ago. It remains in the top 25 today. Among her album’s competitors are new CDs from Andrea Bocelli, Björk, Murray Perahia, Renee Fleming, the Vienna Philharmonic, Elvis Presley (! ), and Heart (!). The reviews of Ms. Stavreva’s album are in, they are stellar (and this website has been quoted); the record-buying public has followed, and listeners are discovering an important new talent. It is a huge accomplishment for an artist who seems to be acting as her own press agent, marketing team, and sales crew, when one notices that every other artist in the Top 25 is signed to a major label. She is not. Ms. Stavreva’s career got off to an attention-grabbing start (is she pure classical? jazz? a new fusion?) and now attention is being paid (and the answer to the questions is simple: she’s a great pianist and enjoy her work). This is the new world that social media is creating: artists and listeners can more easily interact. Ms. Stavreva sent out a press release in October to every person in her extended social media circles. (By extended, I mean she and I have not met.) I visited her website, became a fan of her music and her experiments, wrote her a note. The holidays approached and she published a reminder that her album was due to be released. I bought it and wrote a review praising it. That same afternoon, the payment did not go through, and here is something that I hope Ms. Stavreva never loses, even as she grows more and more successful, which she will: she messaged me herself. I fixed the situation, and she sent a thank you. Then the first payment went through a day later, and we exchanged jokes about my being the proud owner of two copies. Perhaps Murray Perahia knows the names of each of his fans (I am), but this is the life of an independent musician, an independent writer, an independent artist. For instance, I can name most of the individuals who have read The Gad About Town. We’ve exchanged notes. I do not know if this web site will grow or stay the same size; I am confident, however, that Tania Stavreva’s career will grow, that she will be signed to a major label (if she wants this to happen), and I am also confident that she will stay devoted to her fans on a personal, one-on-one level, because she is that passionate about sharing the music she loves. Amazing enterprise along with talent!